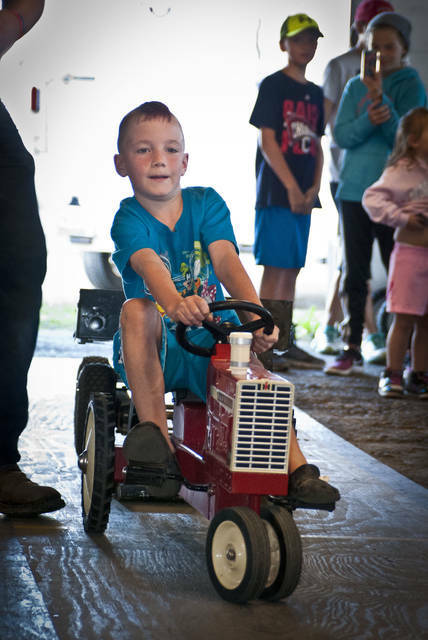 There wasn’t anything that was going to keep Bryson Whitaker from pedaling farther than anyone else in the Pedal Tractor Pull for kids. 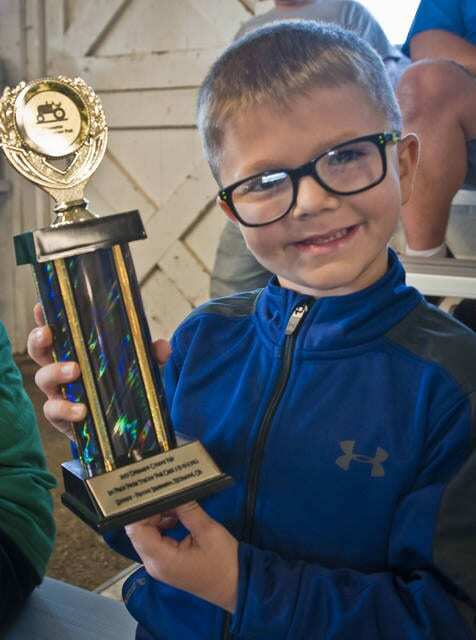 It paid off for Bryson because he took home first place in his competition. The Tractor Pedal Pull takes strategy, determination and strong legs to get as much distance as possible. No one knows that better than George Wright, 7, who strained to get every inch he could out of his pull. Cole the cow doesn’t understand why he must have a bath and blow dry when he would rather be in the field grazing on some tender grass. Austin Dilley, 12, a student at Buckeye Valley Middle School, preps Cole for judging for Dairy Feeders. 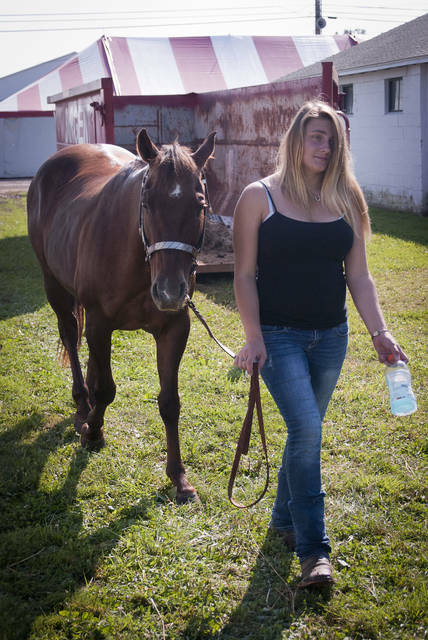 Allie Beekman of Centerburg was busy early Saturday morning, before the official open of the Delaware County Fair, in the cattle wash area of the junior fair barns. In her fifth year to show, Beekman, 15, gives Krave the best scrubbing of his life whether or not he needs it. Beekman said this year she named all of her cattle after cereals like Coco Puffs, Tricks, and Krave. According to the Market Chicken judges, chickens need to be wide, uniform and firm to be considered a champion. 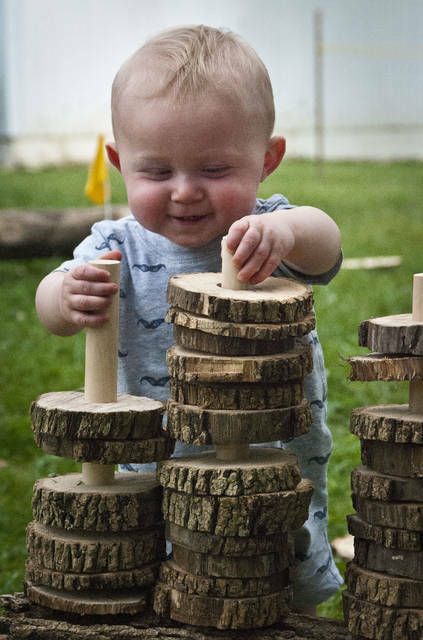 Maggie Pyle’s chickens had all three qualities. 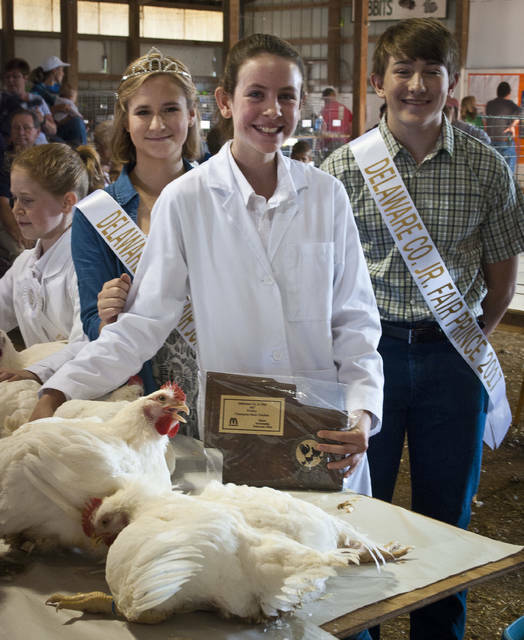 Junior Fair Princess Kayla Kramer and Junior Fair Prince Jacob Carey presented Pyle with the Champion Meat Chicken plaque. 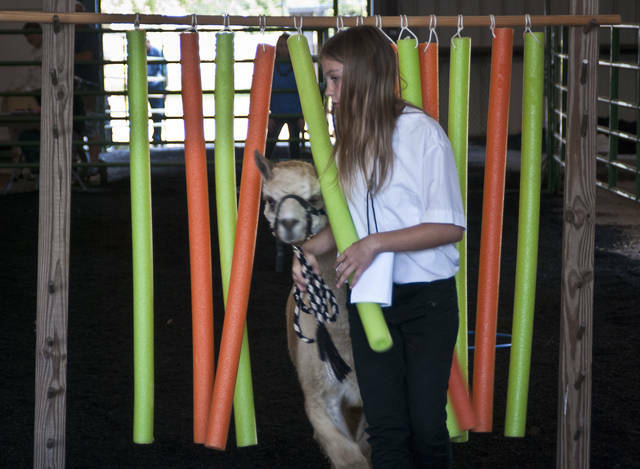 Llamas had their day to shine Saturday as they were led through a course of obstacles in front of a small crowd and judges. The curtain of pool noodles stopped a few llamas in their tracks. However, Frank trusted his trainer, Lydia Bendele, as she led him through the curtain. 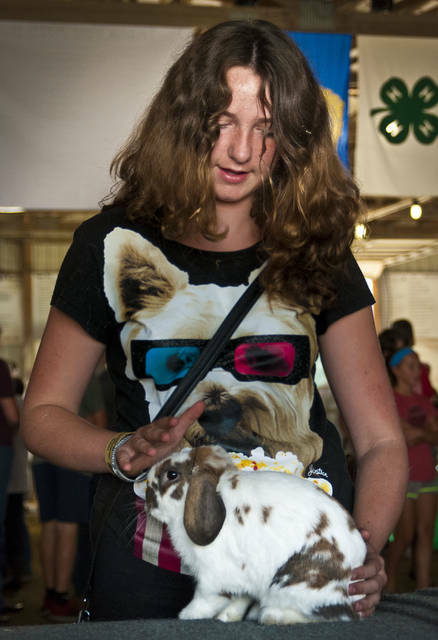 Getting rabbits to sit still during judging is big challenge for trainers. Before facing the judge, McKenzie Leving works with her rabbit, Trip Hazard. 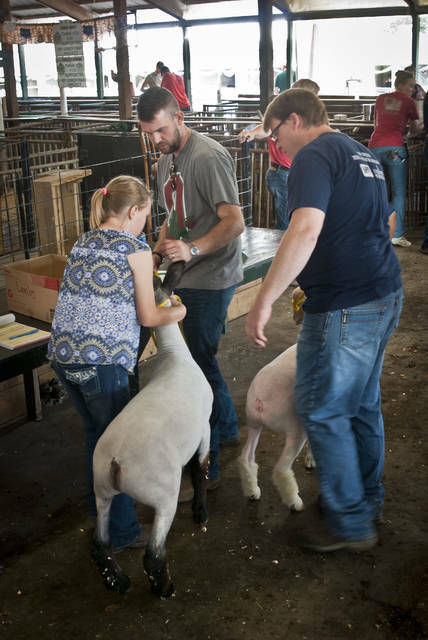 In the sheep barn, participants showed their animals in the Market Lambs competition Saturday. As the participants stood in line waiting their turn, the lambs had other ideas of what they wanted to do. Participants had to wrestle some of them up to the check-in area. Paying attention to the small details is the difference between the first place and second place. 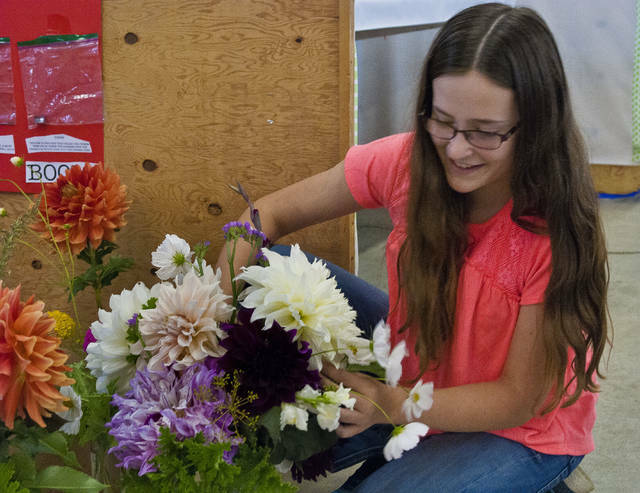 Shannon Barr looks at the details of her floral arrangement just before judging began Saturday in the Designers Choice category. 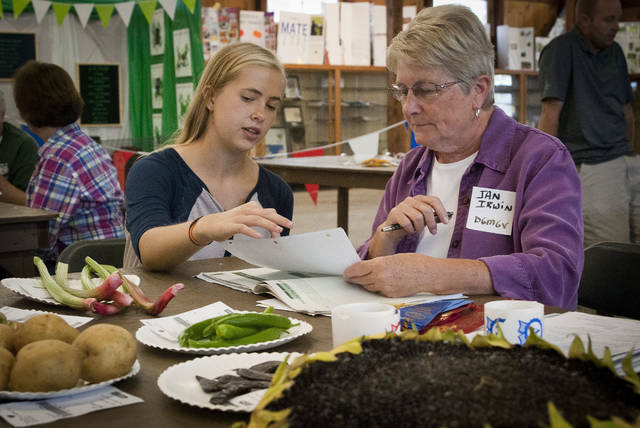 Delaware County Master Gardener and Judge Jan Irwin, right, listens to Erin Barr’s presentation about her project Growing with the Season Vegetables Two. 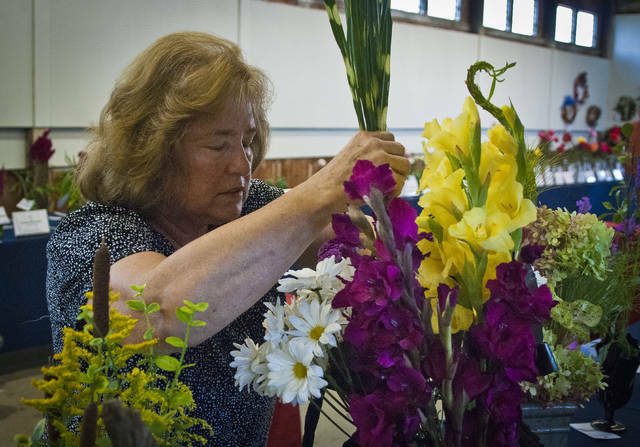 Once her floral display was in place, Nancy Singer decided it needed a bit of trimming because it was too tall. She said she has been doing arrangements for at least 30 years. Many beautiful quilts hang in the Arts and Craft Barn. Earlier on Saturday, the quilts were judged and awarded prizes. 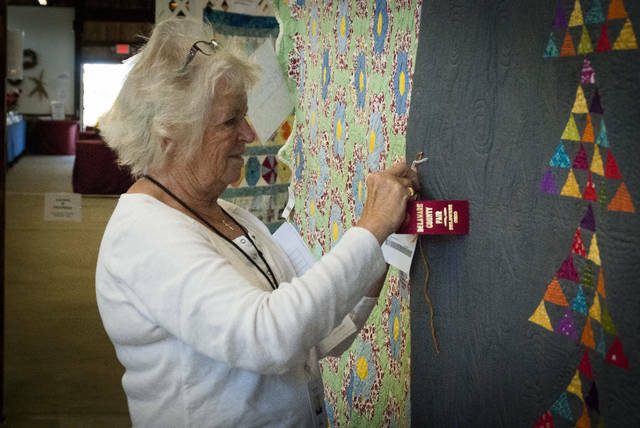 Sandy Lewis places a red ribbon on a quilt that received second place. Fluffy sheep win, but fluffing them takes lot of wrist action and hard work. Hannah Edelblute is no stranger to fluffing. 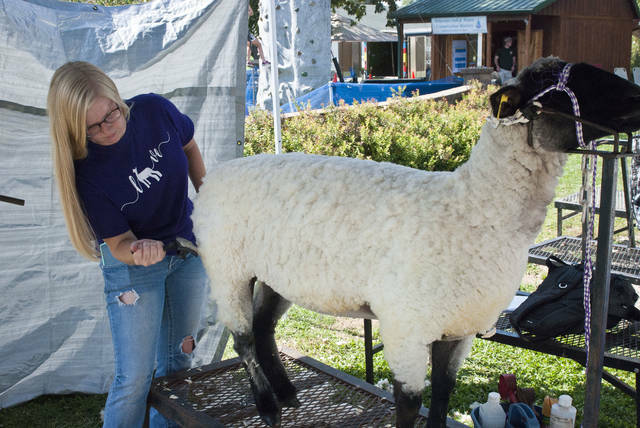 She has been been showing sheep for nine years and this is her last time at the fair. Thump, thump, thump, POP! was the sound the 1916 original case engine made as its owner Paul Thomson watched in fascination. 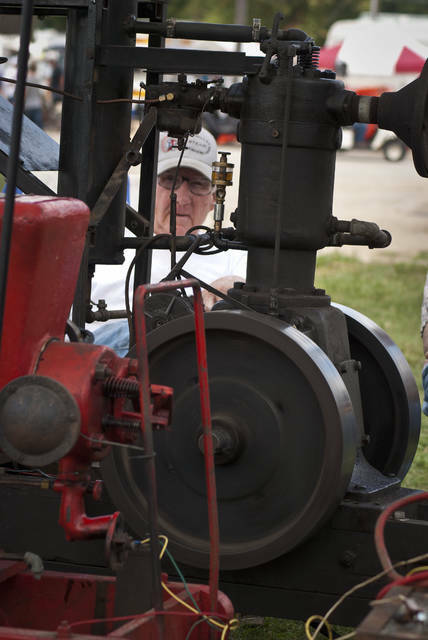 Thomson said the old engine ran a farm shop for many years before it was retired long ago. These mini tractors are not meant to be used as garden tractors because it would do more damage than good to the yard. 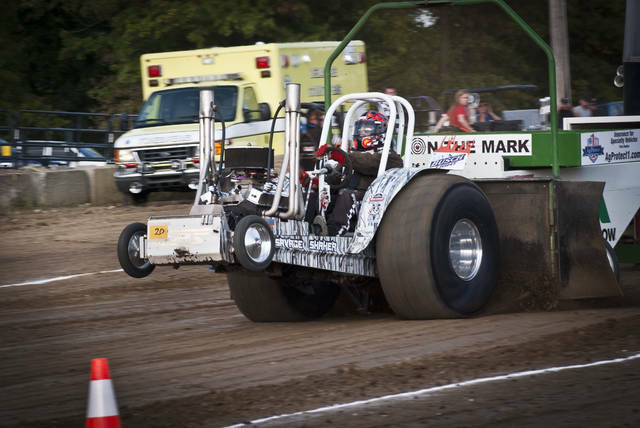 The Mini Tractor Pulls proved to be an exciting time Saturday afternoon as contestants tried to pull the sled as far as they could on the 300-foot track. 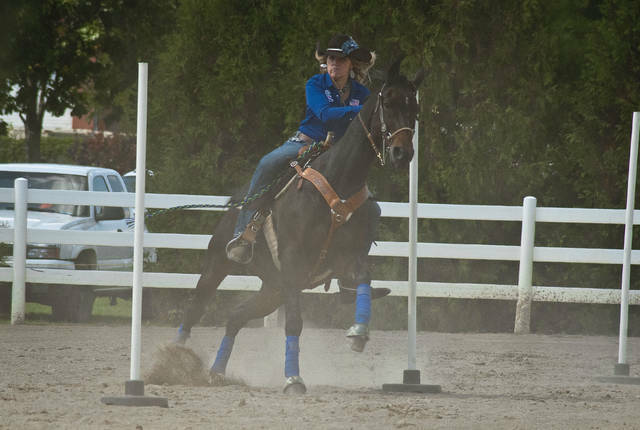 Over the years, Kashia Blackburn’s repertoire of showmanship has grown to include dogs, horses, and hogs. 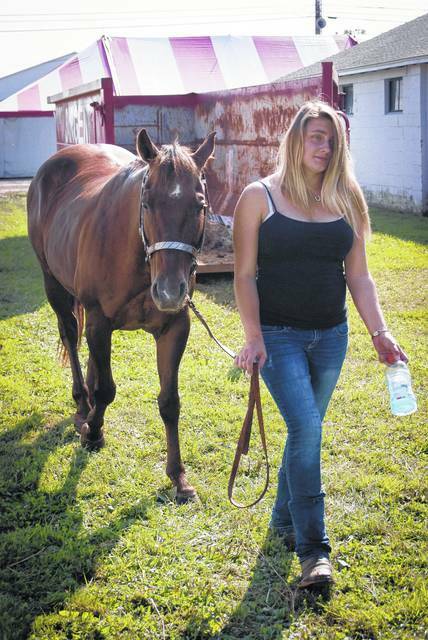 The 19-year-old said she still has one year left to show after this year. She is walking her horse Ja-Smartfaith to get out of the warm barn.